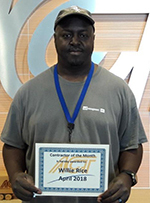 Willie Rice was selected for April Contractor of the month. Willie lives in Brazil, IN. His safety advice is to always have as much following distance as you can. Willie enjoys seeing the country. Willie says about ACT, “Equipment is top notch, good safety record, which helps at the scales, and nice office staff.” Willie’s DSM is Elishia Ford.